The first thing an auditor wants to see is that you have a system in place to keep you in compliance with the DOT regulations. Our simple systems helps you gather all the information you need to successfully pass your audit. A DOT New Entrant Safety Auditand aDOT Compliance Revieware the two most common types of DOT Audits. Neither are fun to go through, but there is a night and day difference if you are prepared. Every company that applies for an MC (Motor Carrier) Number will receive a New Entrant Safety Audit within the first 12 months. To learn more about how we can help you prepare for this type of DOT Audit, click on the link above and you will see how can can turn this long ordeal into a quick and easy visit from the auditor. If you have been scheduled for a compliance review, the DOT probably suspects you of poor safety practices. Don’t give them a reason to issue you a fine or even worse, issue an out of service order, make sure you are prepared for the DOT visit. We can help, click on the link above to find out how. No Matter Which Type Of DOT Audit You Are Facing, we can help. We have a package for everyone, from Full-Service to Do-It-Yourself. We know you are busy hauling loads, so let us take this load for you. After gathering information from you, we will build your folders. There will be some information that you will need to insert in the folders after you receive them from us, such as power unit and trailer maintenance records and log books. If you choose this option you should have no trouble passing the audit. In fact, while we can’t guarantee you will pass, so far we have had a 100% pass rate when we build our clients’ folders for them. 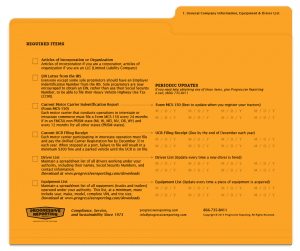 Our DOT Audit Assistance Package includes nine folders with instructions printed on them detailing what each folder must contain. You will also be able to download 13 other files and forms, including an employment application, that help you capture all information required in a DOT Safety Audit. Additionally, we will make available a sixty-seven page guide which contains all of the information you need to prepare for the audit. If you follow the guide and our folder system, you will have no trouble passing the audit. This image will give you an idea how our system works.The front left of each folder shows which items are required in the folder and the right side shows which items need to be updated on a regular basis. No matter which option you choose, Progressive Reporting Agency will help you prepare for and pass your New Entrant Safety Audit. Call us today at (866) 736-6507and let’s get started preparing for your audit.